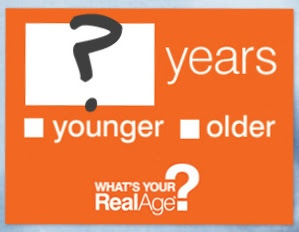 With all the anti-ageing products on the market today, it's becoming increasingly difficult to tell a person's age. We have often heard (or received) comments like "Oh, you look so young for your age!" or "Is that your mother / father? Looks more like your elder sister / brother!" Are these real compliments or mere flattery? For me personally, I go by how my body feels when I get out of bed in the morning, and how I look in the mirror before I wash my face. There are days when I feel great, and there are days when I wish I were 30 years younger. For a more reliable age indicator, you might want to take this series of tests published in The Daily Mail on 28 Dec. They are easy and fun to do. Here are the first three tests. Go to the website for the rest. WHAT TO DO: Count backwards in sevens from 100. If you are under 40, it should take no longer than 20 seconds. If you are between 40 and 60, it should take no longer than 40 seconds. WORK OUT YOUR SCORE: Take off two years if you’re quicker than these times. Add two years if you’re slower than these times. WHAT TO DO: Place your hand flat on a table and pinch the skin on the back of the hand, grabbing as much as you can. Hold it for one minute, then let go. Watch how long it takes to regain its normal appearance. WORK OUT YOUR SCORE: Less than one second: take three years off your age. 1-2 seconds: stay the same. 3-4 seconds: add one year. 5-10 seconds: add two. 11-30 seconds: add three years. WHAT TO DO: Stand on one leg and hold on to the other by bending it at the knee back towards your buttocks. Place your hands on your hips and close your eyes. Time how long it takes you to lose your balance. WORK OUT YOUR SCORE: If you last one minute, take off four years. For 30 seconds: take off two years. Less than a few seconds: add three years. Or you could try this one at Real Age, designed by Dr Mike Roizen and Dr Mehmet Oz, authors of the best-selling series of health and wellness books YOU. The test is rather detailed. Working through the questions was a wake-up call for me to pay more heed to certain areas of my health. I will turn 63 next year, but my real age as determined by my answers in the test came as a shock to me. Would you have the curiosity and courage to find out how old or young your body really is?? With a little help from the Retirement Docs' Quiz you can rate yourself and find out whether you have the traits that are prerequisites for achieving retirement happiness. If you don't, it's not too late to make adjustments or changes for a new YOU in 2011. I took the quiz and my score put me in the top 40 percent, indicating that I still need some "fine-tuning in specific traits". Do take the quiz and find out how you fared. The quiz is a condensed version of the much larger Retirement Docs' Survey conducted by medical doctors F.T. Fraunfelder and J.H.Gilbaugh. More than 1500 of their patients, all retirees, participated in the survey. The data collected forms the backbone of their book "RETIRE RIGHT". From the survey results the doctors discovered that the top 20% of the respondents shared the same traits. The conclusion - if we possess these traits, the authors guarantee that we too will have a highly successful (=happy+fulfilling) retirement. For more details on each of these traits, you will have to read the book. It's available on Amazon. I managed to borrow a copy from the National Library of Singapore. I intend to start working on improving my score right away. That's my retirement investment plan for 2011. Much more meaningful than making new year resolutions. Would caregivers for the elderly do a better job if they could experience the daily challenges that their patients or loved ones go through? The Tsao Foundation of Singapore believes so. The voluntary welfare organization has been running workshops to train staff of the SingHealth group to better understand the daily challenges faced by the elderly in carrying out simple tasks. So far 400 of the 20,000 employees have attended the workshops in batches. My mom's daily calendar on the left, and my wallet-size 2010 calendar on the right. As we age, we need larger text to enhance readability. Given that about one in 11 Singaporeans today is aged 65 and above, and one in five by 2030, this initiative is timely. Workshop participants don partially blurred glasses to experience what it is like to perform tasks like reading labels on medicine bottles, or buttoning up a shirt with their fingers bandaged and unable to bend. Malaysian Healthy Ageing Society conducts a comprehensive training programme for caregivers﻿ for the elderly. 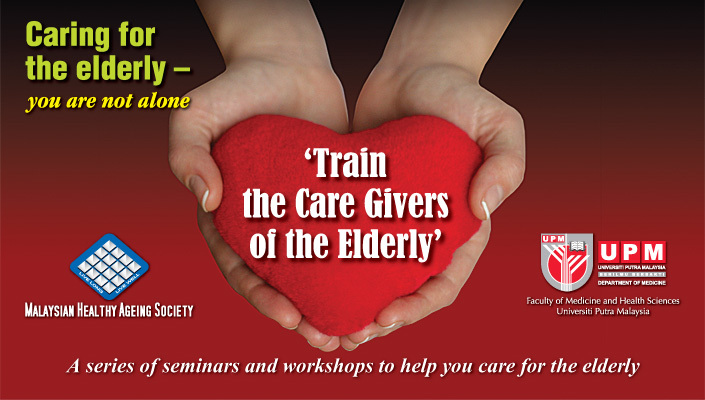 If you are looking after an elderly parent or relative, you will find the 2-day programme extremely helpful. Over the past weeks disgruntled readers, mostly senior citizens, have written to the Straits Times complaining about being discriminated against when applying for credit cards. I can empathize with them as it too happened to me several years ago when ﻿my credit card application was rejected by Public Bank. It was my first encounter with age discrimination, and my first bitter taste of a loss of self-esteem. I was left with no choice but to apply for a supplementary card under my daughter's name in Singapore and my other daughter's name in Malaysia. 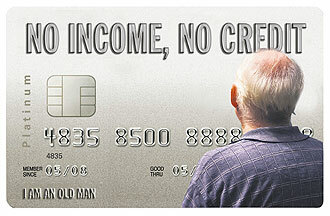 Once you hit retirement age, banks assume you are no longer credit-worthy. Overnight you become persona non grata and considered a credit risk, never mind that you may have an impressive share portfolio or healthy FDs with the banks. What is of paramount concern to them is that applicants must have a steady monthly income. Younger people have hardly any savings and habitually run up credit card debts. Yet they are able to apply for multiple credit cards just because they have a regular job, whereas retirees with sizeable savings and investments are considered a financial security risk. How absolutely ridiculous! The media focus on this issue has put banks on the defensive. DBS, OCBC, UOB, HSBC and Standard Chartered have reiterated that they do not discriminate against elderly credit card applicants. Maybank says elderly applicants are eligible for a 'secured credit card' provided they have at least S$10,000 in fixed deposits to cover any credit card debts incurred. The banks can say all they want about welcoming eligible applicants regardless of age, but rejected applicants tell a different story on the Straits Times online forum. Banks need to work on their credibility quotient as much as they expect their older customers to be credit-worthy. 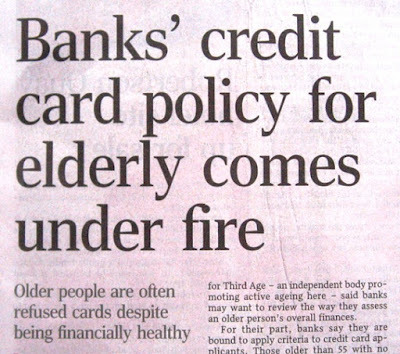 It's high time banks re-looked their eligibility criteria for older credit card applicants. With Singapore's ageing population on the rise, banks will stand to lose out if they continue to practise discriminatory policies against the elderly. In this day and age, I am often amazed at the number of older people I meet who confess to being computer-illiterate. They tell me they regret not picking up pc-skills in their younger days, yet refuse to entertain any suggestions to learn. Their stock response: "Oh, I'm too old. Technology is for young people." They probably don't see the benefits of being tech-savvy at their age. It's all to do with attitude and interest, and nothing to do with age. Lillian Lowe is proof of this. She turns 104 in two months, and is probably the world's oldest Facebook user. 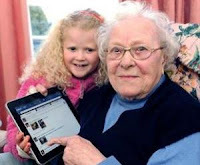 She regularly accesses her Facebook account from her grandson's iPad. She signed up only a few weeks ago to keep track of what her seven grandchildren and 13 great-grandchildren are up to, and is now a huge fan of the social networking site. Some of the students I teach at the open university are in their 50s and 60s. They come to my Learning Skills class with zero knowledge of pc basics. But after just one hands-on session at the computer lab, they are ready to do their research and assignments using their new pc-skills. It is that easy to learn the basics these days, unlike the 1980s when we had to learn all the DOS commands to perform simple computer functions. Do forward the website at http://www.teachparentstech.org/ to your friends. 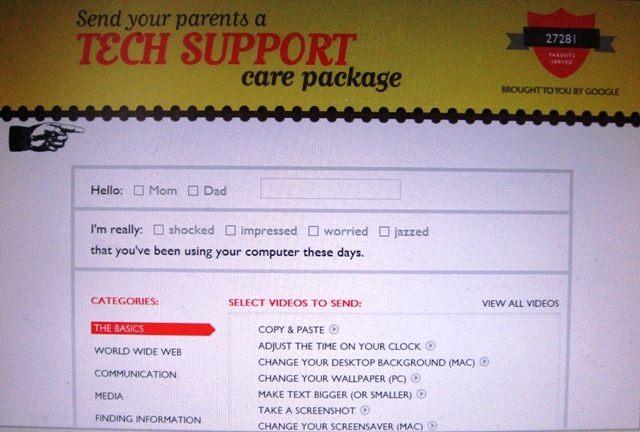 Google has come up with a 'TECH SUPPORT' care package that you can send to your parents (or grandparents, grandaunts and granduncles). The package consists of short videos with simple step-by-step instructions on how to perform basics e.g. how to copy and paste (a favourite with students!) and how to make text bigger (a favourite with older folks!). There are other categories as well, including how to access the world wide web and use online communication tools for social networking. 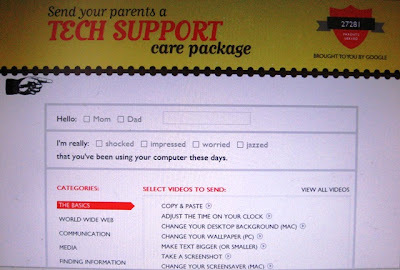 I discovered this technical care package on Eldergadget, a must-visit website if you are interested in elder-friendly gadgets and gizmos. Or if you are looking for the top 10 pick of Christmas gifts for your friends. No more excuses to remain pc-illiterate. And welcome to a whole new world of knowledge, fun-learning and social networking. In 2006, centenarian granny Wook Kundor married her 23rd husband. She was 104 at the time, and he was 34. 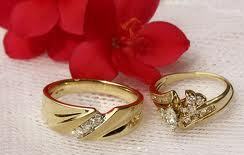 Recently, an under-aged 14-year school girl married her 23-year old teacher. The public furor hasn't even died down yet, and now we have another marriage that's making headline news around the world. I am referring to the marriage of Chief Minister of Sarawak, Tan Sri Abdul Taib Mahmud, 74, to a 28-year old former Lebanese flight attendant. Is Malaysia becoming a land of age-defying marriages? Grandma Wook is a picture of joy in the arms of her husband. She claims she has a secret recipe to keep her husband happy. 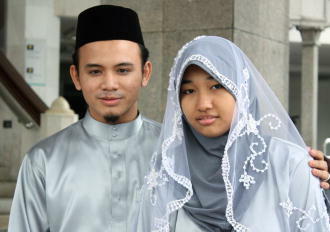 Abdul Manan and his student-bride 14-year old Siti Maryam. Their marriage was approved by the Syariah Court. Can a young man of 23 remain faithful to his wife for the rest of his life? For a Muslim man, this isn't a problem as he can have four wives. Or he can choose to divorce his current wife and marry again. All it takes is for the man to 'utter the divorce declaration' to his wife, and if the Syariah Court approves it, the divorce becomes valid. No small feat for a 74-year old grandpa with 15 grandchildren to win the heart of a beautiful 28-year old woman. He must be the envy of men everywhere. If age is not on your side, being immensely wealthy helps. ﻿Came across the above while clearing my backlog of papers this morning. It's a picture we will never see in Malaysia - a Rabbi, a Buddhist monk and a Muslim cleric chatting and smiling at an interfaith dinner. Indeed, every attempt to set up an interfaith council to foster religious harmony has been shot down by the BN government for 101 reasons mostly to do with FEAR - from fear of causing confusion to fear of conversion, plus all the 99 other reasons in between. What we have instead is the Malaysian Consultative Council on Buddhism, Christianity, Hinduism, Sikhism and Taoism. How can this council be effective when the majority faith is not represented? How can we ever have a platform to discuss interfaith issues affecting the citizens, especially the minority groups? The Inter-Religious Organization of Singapore (IRO) was launched in 1949 as the Inter-Religious Organisation of Singapore and Johor Bahru. In 1961 it was renamed the IRO. Members come from the 10 major religions: Hinduism, Judaism, Zoroastrianism, Buddhism, Taoism, Jainism, Christianity, Islam, Sikhism, and the Bahai Faith. 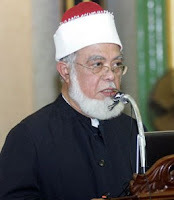 This year's recipient of the annual IRO award went to 72-year old Mufti Syed Isa Mohamed Semait, possibly the world's longest serving mufti. He will be retiring after 38 years of service. The award is a recognition of his role in linking the Muslim community to other faiths. He also received the Public Administration Medal (Gold) at the 2009 National Day awards, for the advice and guidance he provided to the Muslim community and the Government on matters pertaining to Islam. Bearing in mind that Muslims form only 15% of the population, both awards speak volumes about interfaith harmony in the island nation. Now imagine a similar award being given to a leader of a minority religious group in Malaysia. Oh dear, even in my wildest of imagination I have difficulty visualizing such a picture! Despite the progress made by women in all spheres of life and industry, it is still pretty much a man's world. In almost every country, women outnumber men and outlive men, and if given half a chance, they would outperform men. In Malaysia, women make up slightly more than half of the total population of 28.25m. However, this is not reflected in the number of women in the work force. The public sector remains the largest employer of women. The civil service, in particular, the teaching and nursing professions, is overwhelmingly staffed by women. This imbalance is not ideal either. Debate on "There's Nothing Stopping Women!" moderated by TV and theatre personality Asha Gill. For the motion (from right): Sakie Fukushima, Rita Sim and Dr Zaha Rina Zahari. Against the motion (from left): Datin Mina Cheah-Foong, Shivani Gupta and Datuk Dr Rafiah Salim. Guess which team won the support of the floor? Click here to read more about the debate. All ears as the debaters present their arguments. In the corporate sector, especially at top managerial level, the number of women in decision-making positions continues to be pathetic. Only 6% are corporate directors and 7% are CEOs. These figures came from the Deputy PM himself in his keynote address at the just concluded 2-day Women's Summit on 8-9 December. The theme for this year is "Changing Mindsets, Transforming Lives". International speaker and author Avivah Wittenberg-Cox provides convincing data to show that companies with more women in top managerial positions are more profitable and efficient. It's time for women to change their mindset and get rid of their "I'm not good enough" mentality. They should stop viewing themselves as good only for child-bearing, house-keeping and bed-warming. Given the right opportunities and support, women can excel in anything they choose. (Slide from Jen Dalitz's presentation "The Networking Advantage"). Unfortunately, it's an uphill task for women to shine in the corporate sector. 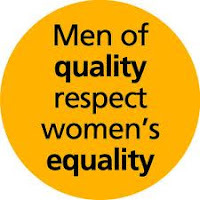 Opportunities are limited, and gender discrimination is still practised. There is always this nagging concern that it's money down the drain to train women and groom them into captains of industry. Once they are in the family way, they either go on extended maternity leave or opt out of the work force altogether to raise their children. It's not easy to juggle the demands of work and home, and still have room for your own needs. But it can be done, and that's why women are so much more efficient and better at multi-tasking than men. No wonder the birth-rate has fallen from 2.6 percent in 2000 to 2.2 percent in 2008. The downward trend is expected to continue. Career-focused women have little choice but to either delay having children or not have any at all. The response from the private sector has so far been lukewarm. Not surprising, considering the decision-makers are predominantly male. The old boys fraternity is very much alive in the corporate world. A simple village woman once said: "By pushing women down in society, and not helping them grow and offer their talents, we have made them bonsai trees. Neither can birds nestle in their branches, nor is the wood of any use." Women have so much to contribute to the economy - if only men would allow them to do so. Know what to do when someone chokes on food. Learn how to perform the Heimlich Manoeuvre for CHOKING ADULTS. 1.From behind, wrap your arms around the victim's waist. 2.Make a fist and place the thumb side of your fist against the victim's upper abdomen, below the ribcage and above the navel. 3.Grasp your fist with your other hand and press into their upper abdomen with a quick upward thrust. Do not squeeze the ribcage; confine the force of the thrust to your hands. 4.Repeat until object is expelled. If you prefer to view the procedure, this YouTube clip shows you how. For more on how to perform the Heimlich Manoeuvre on choking infants, and on yourself if you are alone, visit the Heimlich Institute website. Chew your food properly before swallowing. Avoid laughing or talking loudly while eating. Avoid taking overly large mouthfuls. Death remains very much a taboo subject. Everyone faces death sooner or later, yet no one wants to broach the subject, even when death is knocking on the front door. Blessed are those who live to a ripe old age, who quietly make their exit in their sleep with a smile on their face. As my 85-year old mother loves to put it, "they have gone on a world cruise with no return date". But for many others dying is a long painful process where the quality of life is almost non-existent, and death offers a welcome release. I have seen family members in their final days hooked up to all kinds of machines, consumed by pain and barely conscious. It is a heart-breaking sight. And it begs the question - how far would you go to sustain the life of someone you love? Unfortunately for me and my fellow hawker food lovers, the Health Promotion Board (HPB) of Singapore has warned that consuming hawker fare is potentially hazardous to our health because of the high salt, fat and/or sugar content. 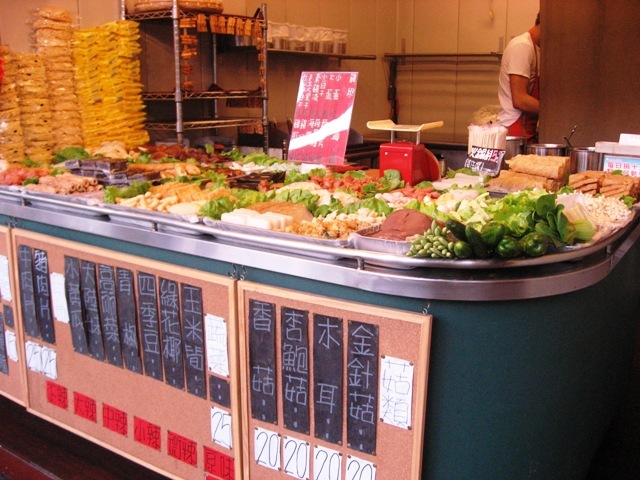 A yong tau foo outlet in Taipei. Too much salt? 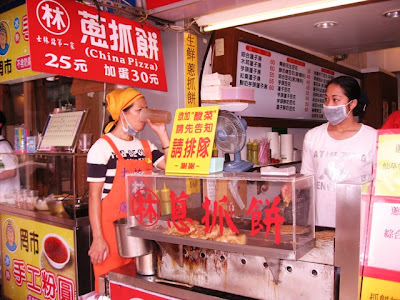 In Taipei, it's called China Pizza. In Singapore and Malaysia it's better known as roti canai or prata. Too much oil and saturated fat? 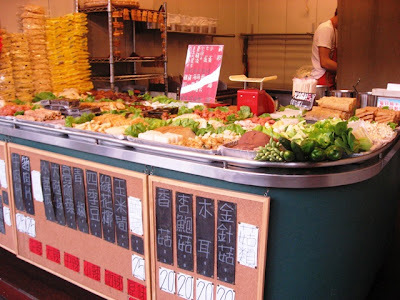 I had lunch at this economy rice outlet in Taipei. HPB's advice: select more vegetable dishes. It takes a certain amount of will power to resist the lure of these 'danger' foods. The good news is an increasing number of food outlets and even public hospitals are now offering healthier food items on the menu. Brown rice, low-fat milk, purple wheat noodles and whole grain bread are fast becoming the preferred choice for better nutritional value. 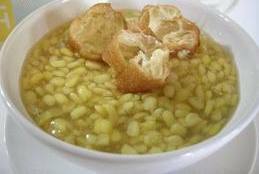 At food outlets, it is now common to hear customers asking for less sugar in their drinks, or less salt in their food. 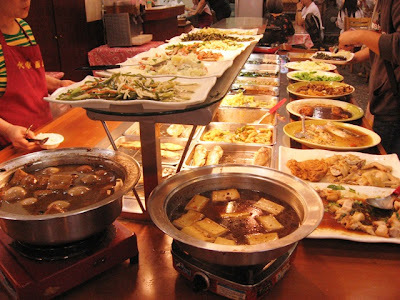 They are opting for more vegetables and smaller amounts of rice or noodles. The HPB introduced the Healthier Dining programme in 2003. Under the programme, more than 2000 hawker stalls have committed to offering healthier dishes. In addition, more than 150 restaurants, with over 200 outlets are participating in the HPB’s Healthier Restaurant Programme. 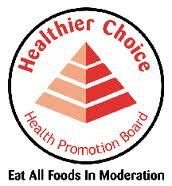 These food establishments have earned the right to display the Healthier Choice Symbol (see logo). For more information on making healthy choices when eating out, check out the HPB website here. 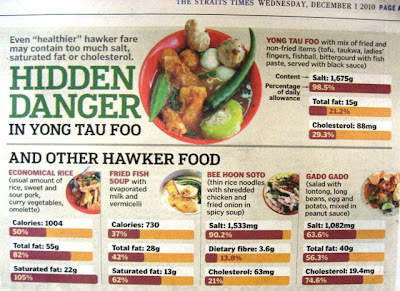 Time to make wise choices in our food intake. Trying to pack as much as you can see and do into a short family vacation involves making choices - and sacrifices. Today, for instance, I wanted to visit the National Palace Musuem. It had come highly recommended as it houses the world's largest collection (more than 670,000 pieces) of Chinese artifacts and works of art. But I knew it would be boring for my granddaughters. Fortunately, we found out there was a children's gallery within the museum complex. So we split up and everyone was happy doing their own thing. I managed to take a shot of this prized 500 B.C. bronze wine vessel in the shape of a mythical bird-headed animal. Amazing design - the head could be removed to fill the vessel with wine, and the beak lifted to pour out the wine. But imagine the weight! Visitors were not allowed to photograph any of the artifacts, as I later found out. Meanwhile, the girls were kept busy with interactive educational activities like assembling broken pieces of ceramics to form a vase (above), and trying their hands at printing and book-binding the traditional way (below). After the museum, it was the famous Beitou hot springs for the family while I opted for the International Floral Expo, another must-see in Taipei. The queue was so long that it was dark by the time the family finally had their dip in the Beitou hot spring pool! Night falls early at 5.00pm in the winter months. Meanwhile, I made my way alone to the International Flora Expo on the outskirts of the city. Orchids of every species and colour, including some I've never seen before - and I come from the Land of Orchids! The expo wasn't only about flowers. There was a section on fruit and vegetable carving (above) and mini-inscriptions (below). At the Folk Arts Pavilion, traditional arts and crafts were recreated and exhibited. (Above): The Chinese character for 'egg' was inscribed inside this empty egg shell. It was so miniscule that one could only discern it through the magnifying eye-piece in the glass casing. I had time to cover only one of the four parks at the Flora Expo before night fell. The long queues at most of the pavilions were a huge deterrent. But it was worth the 20-minute wait to view the EcoArk. It's the world's first LEED-certified building (Leadership in Energy & Environmental Design). 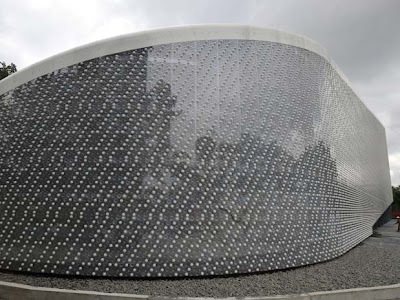 The entire facade as well as the interior ceiling and lighting system was constructed from 1.5 million recycled plastic bottles. The structural framework was built with bamboo and beams made from recycled steel. The EcoArk was engineered to withstand large earthquakes and typhoons. Incredible! Time to bid "Zai Jian", that's "See you again" to Taipei. It's been a hectic four days in the city sampling the food and getting to know more of the people and the culture.